480-117 4:1:1 vs. 4:2:0 on DV Formats. Which's Better? 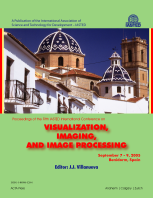 This publication covers the following topics: Applications; Face Recognition and Facial Expression Analysis; Image Acquisition and Camera Calibration; Image Analysis; Document and Video Analysis; Image Coding and Compression; Image Processing; 3D Image Processing; Image Segmentation; Medical Image Processing; Pattern Analysis and Recognition; Rendering and Surface Reconstruction; Tracking; Visualization; and Intelligent Visual Assistance.